Inspired from the collection at Royal Armouries in The Tower of London. 22 to 23 Inch Circumference. This Open Faced Burgonet Helm was the renaissance solution to a helmet that was light and effective. 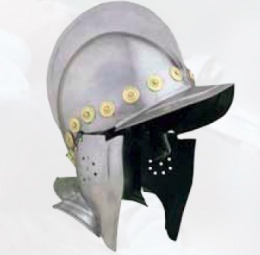 This particular recreation of the burgonet features a large fixed peak across the crown of the helmet, as well as substantial hinged cheek protectors. It also possesses an extended visor in the front, and a short flange in the back. Around the brim of the helm are brass medallion accents. This particular recreation is made entirely in 18 gauge mild steel, and it features an internal liner, 18 gauge construction, and 22 to 23 Inch Circumference. This page was last modified on 19 May 2014, at 19:29.